In this report, insight into the neighborhood and community impacts of distressed properties and distressed property interventions are provided. 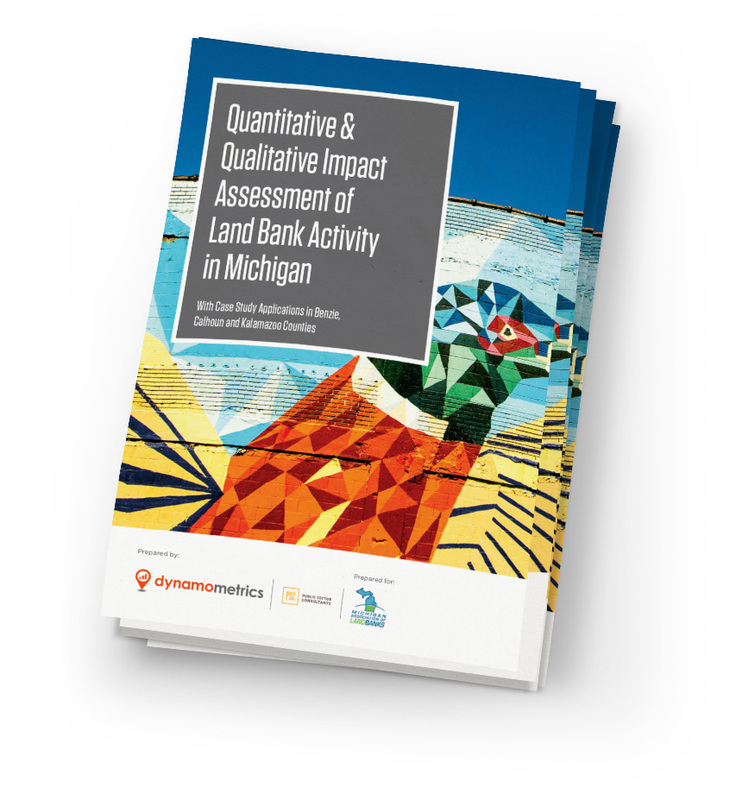 Literature covering methods and estimates of quantitative impact from land bank activity is thoroughly reviewed and applied to case study land bank activities in Benzie, Calhoun, and Kalamazoo Counties. Property intervention impacts are calculated for case studies including residential demolition, residential rehabilitation, and local economic and jobs impacts from land bank expenditures. A qualitative analysis was performed to get a sense of on-the-ground land bank impact. This includes a survey of Michigan's land banks to provide insight into activities and outcomes. Positive impact from land bank activity is identified in both quantitative and qualitative assessments, but problems persist related to the size of the distressed property problem and the budget available to address it. Communities at the Crossroads: A Survey of Five First-Ring Suburbs examines housing market challenges and opportunities facing five of Cleveland’s first-ring suburbs – Euclid, Garfield Heights, Maple Heights, South Euclid, and Warrensville Heights – in the wake of the foreclosure crisis. In addition to a property survey, each of the five suburbs is equipped with Neighborhood Intel, a decision support tool created by Dynamo Metrics. Neighborhood Intel allows communities to monitor the impact of demolition and rehabilitation efforts and easily target trouble spots so that targeted intervention strategies can be implemented. The City of Jackson, MI (Jackson) demolishes distressed houses in an effort to make Jackson a better place to live. In this report, distressed housing is defined as tax foreclosures that become city-owned or are condemned-as-dangerous. It is generally accepted that distressed housing creates many problems, from increased crime to depressed property values. But, until now, Jackson has not quantified the effectiveness of its distressed property demolition program. This study by Dynamo Metrics measures the impact of the publicly funded demolitions on the value of Jackson’s housing stock. Visit the website here to view impact results in the custom online dashboard, mapping tool and policy report delivered to the City of Jackson, MI. The City of Gary realizes that as an industrial legacy city it must make the most of its data to manage problems and plan ahead for redevelopment. Under the joint sponsorship and collaboration of two special-purpose taxing authorities—the Gary Redevelopment Commission and the Gary Sanitary District— Dynamo has developed and maintains Neighborhood Intel for Gary. Working with multiple federal, state, local and public and private partners, Dynamo has become part of a robust comprehensive planning team - delivering pointed specific and general planning tools for decision support. Gary relies on Dynamo to deliver functional decision support products as well as curated data to partners for the comprehensive planning process. In 2013, U.S. Treasury authorized select states to use their Hardest Hit Fund allocations to eliminate blight through demolition. U.S. Treasury authorized demolition of blight because research established that it protects home values and preserves homeownership. Cleveland Neighborhood Progress, Inc. hired Dynamo to investigate whether blight elimination through housing rehabilitation (rehab) also protects home values and preserves homeownership. Does rehabbing vacant and foreclosed properties increase surrounding property values? Is rehabbing associated with a lowering of mortgage foreclosure rates? Visit the website here to view impact results in the custom online dashboard, mapping tool and policy report for Greater Cleveland, OH delivered to Cleveland Neighborhood Progress, Inc. Since Mayor Mike Duggan took office, the City of Detroit has made large strides in removing blighted structures. Thousands of vacant homes have been removed at a more rapid pace than ever before in Detroit's history. In order to better understand the positive economic impact of these demolitions, the Skillman Foundation and Rock Ventures commissioned an impact study to evaluate the economic effect of the recent demolitions. Visit the website here to view impact results in the policy brief and full report for Detroit, MI delivered to the Skillman Foundation and Rock Ventures.